Photo by Matt Urban/Mobius New Media. The Delaware Theatre Company closes their 2015-16 season with Nell Benjamin's The Explorers Club, a delightful farce that kept the audience in stitches. Although I'm not a huge fan of this genre, I did appreciate the witty writing, the superb performances of the ensemble cast (expertly directed by Bud Martin) and the stunning costumes and set. The play takes place in London in 1859 at the prestigious all-male Explorers Club. On this particular day, the members must decide if they will accept their first female candidate (Karen Peakes) who recently discovered a legendary Lost City. Comedy mayhem ensues as members recount their adventures and discoveries, while dealing with their current situation. Ms. Peakes is wonderful in her dual roles -- Phyllida Spotte-Hume, the explorer who is ready to take on the "good ol' boys club" to become the first female member -- and as Countess Glamorgan, Phyllida's hoity-toity, high society sister coping with the consequences of Phyllida's adventures. Daniel Fredrick charms as the Club's diffident president, Lucius Fretway, who is nominating Phyllida (and it might not just because of her work, but that he also has a crush on the beautiful explorer). He and the great Dave Johnson, Luigi the native of the Lost City, share a few exciting scenes involving flying cocktail glasses. Harry Smith is brilliant as the over-the-top adventurer, Harry Percey, who also falls for the gorgeous Phyllida. 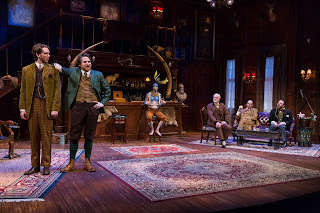 Equally impressive to the performances are the period costumes by Wade Laboissonniere that allow the actors to move freely during some very physical scenes, and the magnificent set by Alexis Distler. From the moment I walked into the theater and saw the two-floor wood-paneled set with a bar and exquisite furniture, I was transported to a bygone era. The Explorers Club isn't exactly my cup of tea, but it IS an impressive production for the whole family to enjoy! The play runs through May 22. For tickets visit www.delawaretheatre.org or call 302.594.1100.